In case you missed it, all conference attendees were entered in a raffle for a ton of bookish goodness. We’re pleased to announce the winners today! And don’t forget! 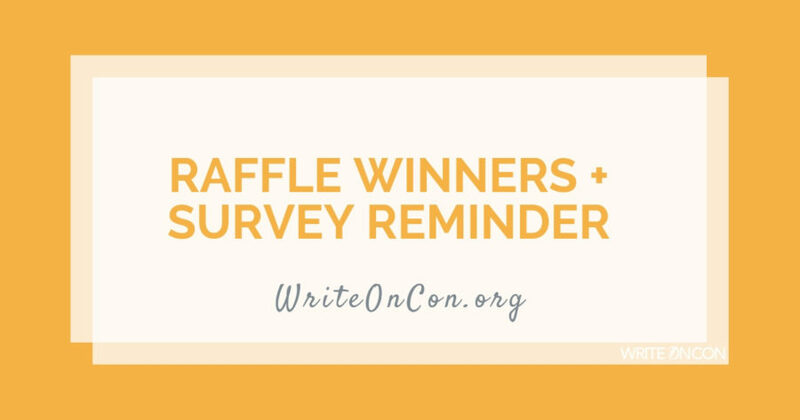 If you take our survey, you’ll also be entered in another raffle — we’ll be giving away five tickets for Extended Admission to WriteOnCon 2020! Winners for the conference raffle (and their prizes) listed below! Signed copy of Don’t Forget Dexter + an art print from Lindsay Ward — Emily B. Signed copy of A Touch of Gold and swag from Annie Sullivan — Hannah H.
Signed hardback copy of The Unlikely Story of a Pig in the City from Jodi Kendall — Jeffery K.
Book Bundle + an enamel pin from Olivia Cole — Laura S.
Paperback copy of Jasmine Toguchi, Drummer Girl and Jasmine Toguchi, Flamingo Keeper from Debbi Michiko Florence — Karen C.
Copy of Tarot from Marissa Kennerson — Andrea C. + Tiffany P.
Signed bundle of Immortals from Tamora Pierce — Elizabeth D.
Book bundle from editor Catherine Laudone — Carol K.
Copy of The Disasters plus swag from M. K. England — Cassidy P.
Query+1st page critique from Lauren Spieller — Amber P.
Signed copy of The Accidental Bad Girl from Maxine Kaplan — Meghan F.
Signed copy of Toxic with swag from Lydia Kang — Rosario M.
Signed copy of The November Girl with swag from Lydia Kang — Jessica B. Signed personalized book from Josh Funk — Barbara W. + Kaitlin H.
Signed copy of Rebel Seoul from Axie Oh –Lana P.
Signed copy of Shadow Weaver and Comet Rising from MarcyKate Connolly –Jennifer B. Running On The Roof Of The World by Jess Butterworth — Ellen L.
Shooting Kabul by N. H. Senzai — Laurel S.
Duels and Deception and Love, Lies, and Spies by Cindy Anstey — Anne D.
Bundle of books from C. J. Milbrandt (Inside the Tree, Into the Hills, Across the Line) — Sarah T. + Erica M. + Payal D. + Amy V.
Bundle of books from C. J. Milbrandt (Down the Stairs, Through the Notches, Back on Track) — Heather W. + Lana S. + Gina M. + Cassanda N.
Bundle of Jonathan Roth books (Too Much Space, Party Crashers, Take Us to Your Sugar) — Meghan W.
Bundle of Michelle Houts & Elizabeth Zechel books (Nuts About Science; Solids, Liquids, Guess Who’s Got Gas; The Colossal Fossil Fiasco) — Maggie N.
Bundle of Rachele Alpine books (Friday Night Stage Lights and You Throw Like a Girl) plus The Star Thief by Lindsey Becker — Sara A. Bundle of Sarah Raughley books (Fate of Flames, Siege of Shadows, Legacy of Light) — Samantha T.
A Void the Size of the World by Rachele Alpine and He Loves You Not by Tara Brown — Kristen W.
Valiant by Merrie Destefano and Monday’s Not Coming by Tiffany D. Jackson — Krista A.